Internationally acclaimed for her vibrant Artistic command, Sydney born pianist Rosemary Tuck reflects her broad musical interests in programs of wide-ranging scope and imagination. 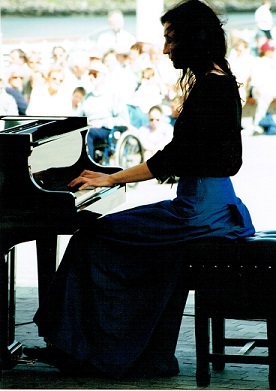 She has performed worldwide including at the Carnegie Hall, the Sydney Opera House, National Concert Hall in Dublin, the South Bank Centre, Wigmore Hall and St Johns Smith Square in London, and at the Aarhus Musikhuset where she appeared live on Danish Television in the presence of Queen Margrethe II. Her touring takes in the UK, Ireland, Denmark, Australia, New Zealand, Asia, France, Cyprus and the USA, with festival appearances including the Aarhus, Wexford, Vendsyssel and Liszt en Provence. Concerto performances include the English Chamber Orchestra, South Bank Sinfonia, ABC Sinfonia and Orchestra of the City in London. Her recent series of piano music by William Vincent Wallace for Naxos was critically acclaimed, and a Critics Choice in Gramophone magazine. Two earlier discs of Wallace on the Cala label resulted in 'CD of the Week' on ABC Classic fm, while she featured in a program on Albert Ketelbey for BBC Radio 4 due to her well received discs of his music on Marco Polo. More recently she was highlighted in a Lyric fm series on the music of William Vincent Wallace. In 2001 Rosemary gave the first official performance in the William Vincent Wallace Millennium Plaza in Waterford, Ireland. Since a concert together in 2004, she has worked closely with Richard Bonynge as both soloist with orchestra and collaborative pianist. They performed with the Southbank Sinfonia in London for the Wallace Bicentennial Celebrations in 2012, and have recorded three discs together of music by Czerny with the English Chamber Orchestra for Naxos. Rosemary was also featured in a radio play commissioned by ABC Classic FM on the life of pianist Eileen Joyce, in collaboration with writer Brian Matthews. While she takes a special interest in the music of Wallace and his contemporaries, her programs can range from Bach to Ginastera, and any one season can be as diverse as the Schubert Wanderer Fantasie, Chopin's Ballade in f minor, the Sofia Gubaidulina Chaconne, Liszt's Mephisto Waltz No.1, late Beethoven sonatas and premiere performances of new music. She has been a Steinway Artist since 2009.